Do You Want A Vinegar Weed Killer Recipe? Take Your Pick... Make Your Own... Or Think Twice? Everyone has weeds. 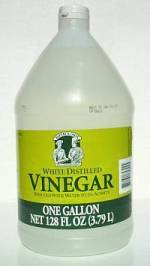 Many have heard that you can use vinegar as an herbicide to get rid of them. Is it true you wonder? How do you use it? Yes, it is a fact that you can kill weeds with vinegar. That sounds great, doesn’t it! People hate to spend money for a product to get rid of weeds, and vinegar is cheap. Many people would like to avoid chemical sprays, and vinegar is all natural. Sounds like the best of both worlds. Except….. there are a few exceptions, limitations, & details, that you should know about before you grab a bottle of vinegar off the shelf and seek revenge on those weeds. Do You Have A Personal Homeyard Security Plan? Vinegar is a natural product, usually derived from grain, apples or grapes. It is distilled through a fermentation process. The vinegar you buy is typically labeled at 5% acidity. This means it contains 5% acetic acid, the active ingredient. Acetic acid is what makes vinegar a weed killer. Actually, it makes vinegar a plant killer. Acetic acid, from any source, will kill most vegetation because it draws all the moisture out of the leaf. It is fast. Spraying full strength vinegar on a plant in full sun will often result in a withered, brown plant in only a few hours, for sensitive weeds, or by the next day in tougher plants. It is non-selective, meaning it might kill everything it touches. This limits the usefulness of a vinegar weed killer, to the extent that you are able to control over-spray that would get on desirable plants. Do you have places where you could use these characteristics of a vinegar weed killer? If it seems like a good idea, how do you use it? That brings up an interesting development. We don’t know whose Grandma started it, or how. It may have been an accident when she tossed out a bad batch of apple cider! The idea has been around a long time. But through the years, there have been quite a few variations for making a vinegar weed killer. Searching the internet and other sources for home made remedies comes up with a wide range of formulas that appear to have originated from one basic recipe. Look at this simple chart to see the range of suggestions you can find. What do you think? Do you want to try them all? The differences in concentration for each ingredient, and the combination of mixes, make you wonder! Are any of them a good idea? If you would like to know exactly what these different ingredients do, you must read What To Expect From Home Made Weed Killer. A few of the critical cautions mentioned will help you narrow down this list of recipes for vinegar weed killer. Some of the combinations seemed too weak and probably wouldn’t work, while others were too wacky to even try. I decided to try the last two on the list, to find out what full strength vinegar as a weed killer could accomplish. I have plenty of weeds in one area of my yard that is not landscaped, so I did not have to worry about over-spray that might kill good plants. I sprayed weeds (1) with full strength vinegar plus soap; (2) with full strength vinegar only; and (3) with soap and water only, just for comparison. The soap added was dishwashing soap, 1 oz per gallon. The weeds were affected the fastest and most completely with full strength vinegar and soap, compared to the two other groups. Weeds in full sun for several hours died faster than weeds that were in shade an hour after spraying. This reflects how the plant requires more moisture in the sun. All the weeds appeared completely dead 24 hours later. A patch of Bermuda grass under one area of heavy weeds turned brown, but eventually recovered. 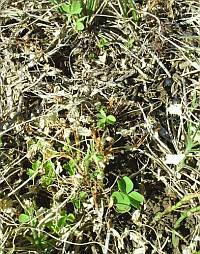 Oxalis, a broadleaf weed, starts to re-grow one week after being sprayed with a vinegar weed killer. Crabgrass also starting to regrow quickly, at about 5 days after being sprayed with vinegar. The vinegar spray without the soap was not as effective as vinegar with soap. It was even obvious while spraying that the plain vinegar was not readily staying on the leaves of the weeds, especially not on crabgrass. Not as many of the broadleaf weeds died, and all were slower to show symptoms. Those that survived were quicker to recover. Control was about half compared to the spray with soap. The crabgrass also recovered more quickly than in the first batch. Dishwashing soap was used at 2 oz per gallon. The soapy water alone had no apparent impact at that concentration on weeds or grass. The soap aids the effectiveness of the vinegar but does nothing on its own (at that rate). I used a small sprayer, 1 ½ quart size, that pumps up pressure. This puts out a smaller, softer spray pattern than my larger tank sprayer. It allowed me to confine the spray to the desired area much better. I also sprayed some weeds in ground cover and had a little bit of overspray. The ground cover died where it was hit, but it is the spreading kind and has filled back in. The conclusion appears to be that a vinegar weed killer can be effective on some weeds, in some situations. However, consider the following information before you decide to try it. Vinegar won’t move through the plant to kill the root, like some chemical sprays will do. The root may die anyway, depending on the variety of weed, and how mature it is. 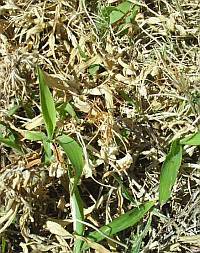 Young weeds may not have sufficient reserves to put out new growth. The older weeds that grow back would be weaker, and many should die with a repeat application of the vinegar weed killer. Vinegar applied to the soil as a full strength drench could kill the root directly. This is not recommended, since roots from good plants could also be affected. Also, the effects on soil microorganisms is unclear. They might die, or move out of the area, or become inactive temporarily. This would reduce soil fertility. Vinegar would lower the pH of the soil, making it more acidic. This could be good if your soil is alkaline, not so good if it is already acidic. Yet, it is unlikely that the small amount used would cause much variation. (EDITORIAL NOTE: If you have a large area to spray, and would prefer to avoid multiple applications, an alternative would be Round-up, or the generic alternatives. It can kill root and all in one spraying. Like the vinegar weed killer, it is non-selective. Yes, this is a chemical spray. I mention it because some of you may find it acceptable. There is strong commentary by both advocates and critics regarding the safety of this product. Glyphosate is the active ingredient and may not be as bad as some other chemicals, in terms of lingering in the soil. Anyone desiring to use a vinegar weed killer should be aware that the results they get will be quite unpredictable. It would be wise to try sampling before using any formula on a broad scale. Vinegar weed killer can be found in a few products made by garden suppliers, but they have to meet certain regulatory guidelines before they can recommend using vinegar as an herbicide. This is for consumer protection. Don’t blindly accept the recommendation of anyone on the internet, or other sources, saying vinegar weed killer is safe, natural and effective. It might be in some situations, but not in others, it all depends. There are so many variables. Use your best judgment. You've learned here the basic factors that should help you decide if it is a good idea to use a vinegar weed killer in your situation. A number of sources on the internet have begun to suggest the use of a stronger version of this homemade weed formula, usually in blogs and forums. Is this a good idea? Gardeners have contacted me inquiring about finding and using a more concentrated vinegar weed killer. It is possible to obtain vinegar in a 10% or 20% concentration, though these are not commonly found at domestic retail outlets. Caution: be extremely careful if you intend to use this harsh product. The fact that it is still called vinegar can lull you into a misguided complacency, thinking it is a mild, natural solvent. Remember, this is an acid, and you need to treat it with respect, the same as with other caustic substances like pool cleaners. OUCH! Caution Repeated: I was quite careful while handling the product, until the very end after cleaning up. Unknowingly, I had spilled over the edge of the bottle and got some of the full strength liquid on one hand. Very quickly I started feeling a burning sensation. I immediately rinsed off the acid, but the damage was done. My skin had burn marks on the affected area, as if I had grabbed a hot bar-b-que grill. I tried the 20% acetic acid and found the results favorable at killing some of the weeds which were resistant to the common formula mentioned above. These were larger, more mature weeds, of different varieties. They responded quite quickly to the spray and did not grow back. Noteworthy is that it was an extremely hot day, which contributed to the impact of being a desiccant to thoroughly dehydrate the weed. Also realize that the stage of growth can affect a plant's regenerative properties. These weeds were already forming seed-heads. Sometimes when a plant has invested its energy into forming seeds, it is unable to recuperate after being harmed. This varies from species to species, so your results may vary. Wear a good quality nitrile glove or some type that is resistant to chemicals -- and be careful. It would also be smart to wear safety goggles and a mask to interrupt any vapors. This may seem silly to some of you macho types, but you never know when something might splash, plus some people will be more sensitive than others. If you are of a mindset to take this approach and try the stronger vinegar solution, here are a few on-line suppliers for the 20% acetic acid product sold in one gallon containers, each found on Amazon. OR Vinegar 20% Gallon size in case of 4. Note that this is typically used at full strength, unlike the concentrated version of chemical lawn and garden products that are diluted with water before spraying. If you dilute the 20% acetic acid you end up with the less potent product like the grocery store variety. The strong solution is too expensive with shipping to plan to dilute it. Also note that the coverage of a one gallon bottle at full strength is going to be limited. Most common garden sprayers will cover at most 1,000 sq. ft. with a gallon of liquid, so consider that into the overall cost of your project before you go this route. As a final note, quite a bit of testing is being done on natural alternatives to the chemical nightmare. Based on that research, the usefulness of vinegar as a weed killer is being better understood. Finding the best way to utilize that knowledge is the next step, and a number of companies have jumped through the required hoops and brought to market a fast acting weed and grass killer that uses the high octane version of this ingredient. These commercial products frequently add various additional ingredients, like citrus oil or clove oil, with the expectation that the mixture will make it work faster, or broaden the effectiveness to kill a wider range of weeds, or make the damage more permanent. It may accomplish that, or it may simply set apart one product from another for marketing purposes. I plan to have some comparative testing done on several of these products later this spring. Check back later for an update to this update. Other active ingredients are being promoted as well, such as concentrated citrus oil, or ammoniated salts of fatty acid. I'll investigate these as well in the future. What To Expect From A Home Made Weed Killer.